Is it really the 22nd of August- when did that happen?? Clearly the summer has gotten away from me, as I was in England and Italy for the first half of the month and barely had time to recover before going to New York to pack up our house before my parents’ impending move. Given that I start grad school next week, I have a feeling my posts will be getting even more infrequent, but I do have a stack of things to post over the next few weeks. I will start with this, which is sure to relieve any start of school stress we may be experiencing. As usual, we had some almost-rotten fruit sitting in our fruit bowl which had to be eaten immediately, so I decided to try out this recipe for banana bread from Smitten Kitchen. Of course, I had the wrong pan so decided I would make the bread into brownie-sized pieces, and once I decided that I thought I might as well throw some chocolate chips and walnuts into the mix. The result was wonderful, and lasted for over a week kept in the fridge. 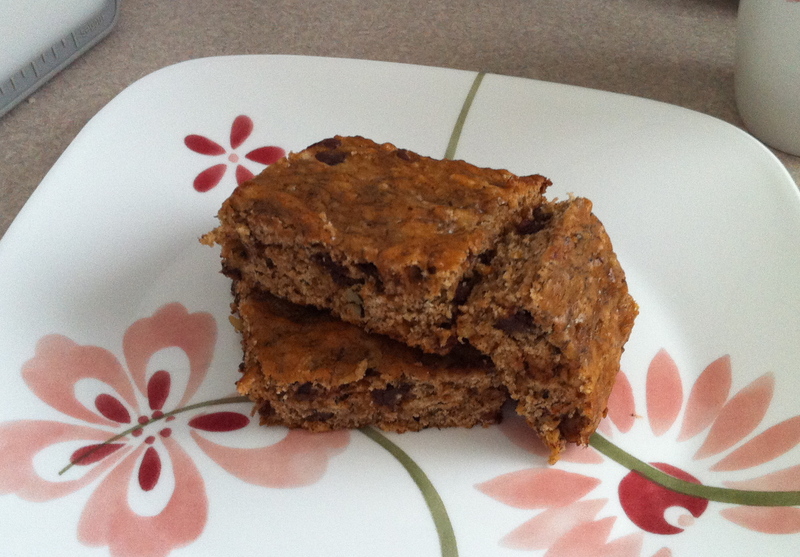 Although the chocolate chips and butter don’t make this the healthiest breakfast, it is certainly one of the most tasty. Preheat the oven to 350 F. With a wooden spoon, mix butter into the mashed bananas in a large mixing bowl. Mix in the sugar, egg, vanilla, and then the spices. Make sure to mix in the egg well. Sprinkle the baking soda and salt over the mixture and mix in. Add the flour and mix. Finally, add the chocolate chips and walnuts and mix to incorporate. Pour mixture into a buttered 9×13 pan, and bake for about 30 minutes. Check after 25 minutes to see if a knife or toothpick inserted comes out clean. Allow to cool for a few minutes, cut into squares and enjoy! Keeps well at room temperature or refrigerated, stored in clingfilm or tinfoil. Due to Father Spice’s well documented love of kale, I thought I would pick some up at Eastern market when Gina and I went a couple of weeks ago. I ended up getting a very large bag of it for a good price, and have been trying to think of creative kale-uses ever since. 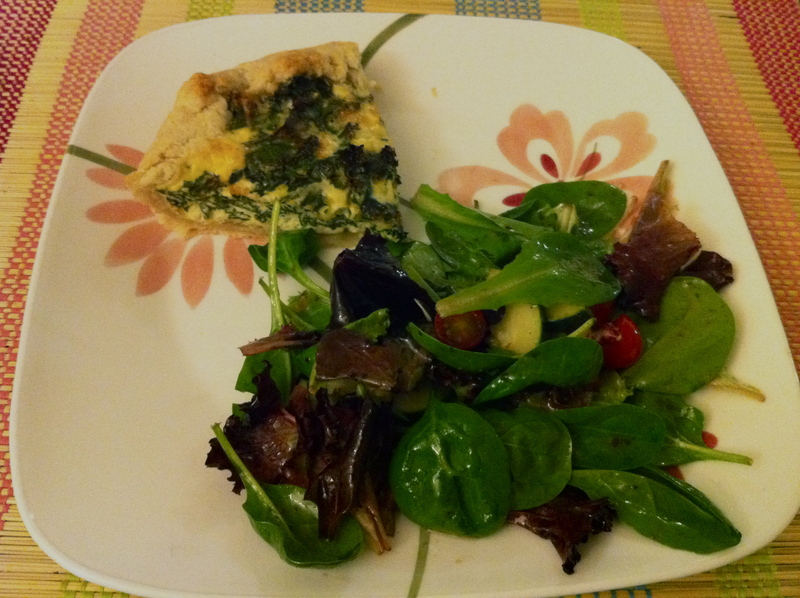 Last weekend I decided to bake the first of the kale into a quiche, which seemed like an easy way to use some up and feed myself and my roommate for a couple of nights. It was a roaring success, and very easy to make- just remember that the crust needs to chill for an hour or so before you roll it out, so make that part first, then wander around the house watching Say Yes to the Dress for a bit. 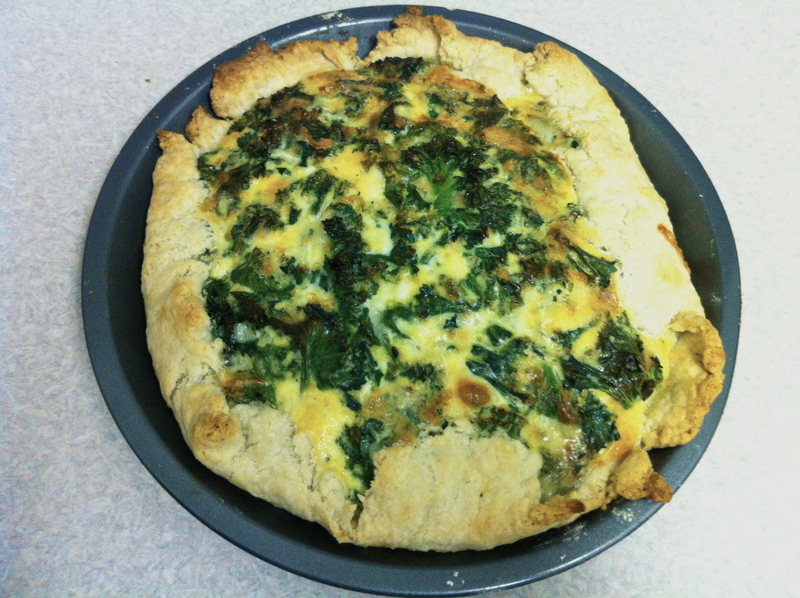 This crust was excellent- very flaky and crispy, and I was glad that I didn’t trim the edges but just folded them over for an even better crust-to-egg ratio. I would probably add more cheese the next time I make it so the flavor really comes through, so I’ve upped the amount in the recipe below, but if you want to pretend to be health-conscious for a night use a bit less. You could also add some sauteed onions, garlic, herbs, etc, to up the flavors, but I was being lazy so just focused on the kale. If you ignore the stick of butter, it looks healthy! Start by making the crust- first put a couple of ice cups in some water and set aside. Put the flour and cold sliced butter into a large bowl and cut with a pastry cutter until the butter is the size of small peas. Alternatively, pulse in a food processor a few times. Add the iced water one tablespoon at a time (or drizzle into the food processor while running), only until the dough comes together and you are able to form it into a ball. It should just stay together without falling apart. Form the dough into a ball, wrap in clingfilm, and chill for at least an hour. For the filling, first remove and tough stalks from the kale pieces. Rinse the kale in water, and the saute with 1/2 tablespoon oil for 3-5 minutes or until bright green and tender. Let cool. Add eggs, half and half, the cheeses, and salt and pepper to a bowl and whisk to combine, then add the kale and mix that into the egg mixture as well. Preheat oven to 375 degrees. To assemble, roll the chilled dough out into a circle and press into a lightly greased pan. Pour in the egg mixture and fold over or trim the excess dough. Bake for 20-30 minutes, or until crust is light brown and filling puffed. Up the temperature to 400 for the last 5 minutes or so if you want the crust to get more golden. I know brunch isn’t a meal that one has every day, but it holds a special place in my heart, especially when the weather is warm and you are allowed to sit outside for hours drinking iced coffee and eating eggs and pancakes and bacon. 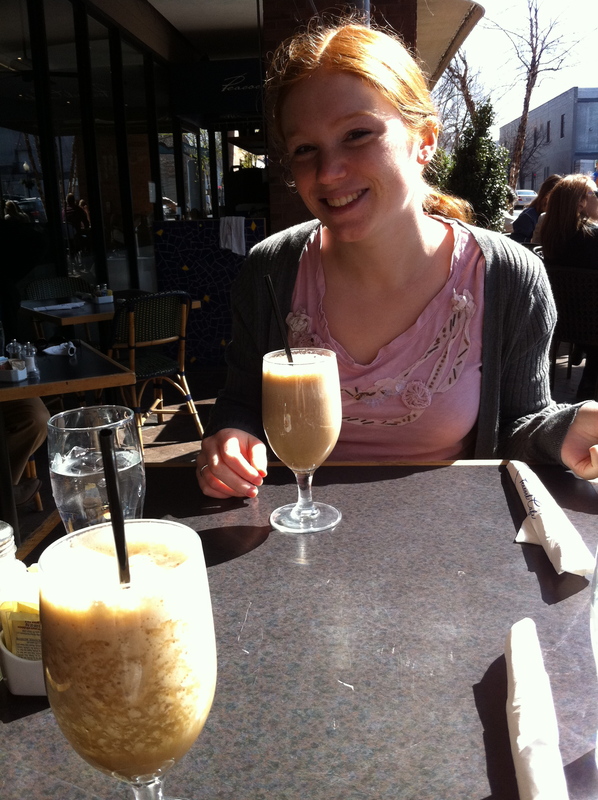 Despite the fact that it is supposed to snow today, we did have a brief glimpse of spring in DC last week, and Gina and I took advantage of the sunshine to get an outdoor brunch at Peacock Cafe in Georgetown. I’ve been going to Peacock with friends for ages, and have many fond memories of Sunday brunches spent re-hashing the last night’s dramas over mimosas and poached eggs. They do pretty delicious lunch and dinner things as well (the Caesar salad is one of the best I’ve had, and make sure you get a side of shoestring fries), but brunch is, in my opinion, where Peacock shines. On the beverage side of things, they have an amazing smoothie and juice bar, which lets you customize a smoothie with whatever your heart and stomach desire. They also have a selection of recommended smoothies on the menu, and if you need your jolt of espresso in the morning, the bananacino smoothie is to die for. Bananas mixed with a shot of espresso and honey seems like an odd combination, but trust me, it works. The aforementioned mimosas are also good if you’re in the mood for something stronger than coffee. The brunch menu has a wide selection of food, and you have the option to order sandwiches, salads, and burgers from the lunch menu if you want to. But for me, it’s all about the breakfast items. I’m more of a savory breakfast person myself, so always go for the egg-centric options, but they also have pancakes and waffles which have gotten rave reviews of friends. The pancakes come with bananas and walnuts in warm maple syrup, and the waffles with strawberries tossed in balsamic vinegar, and both of those descriptions always have me reconsidering my faithfulness to eggs and bacon. 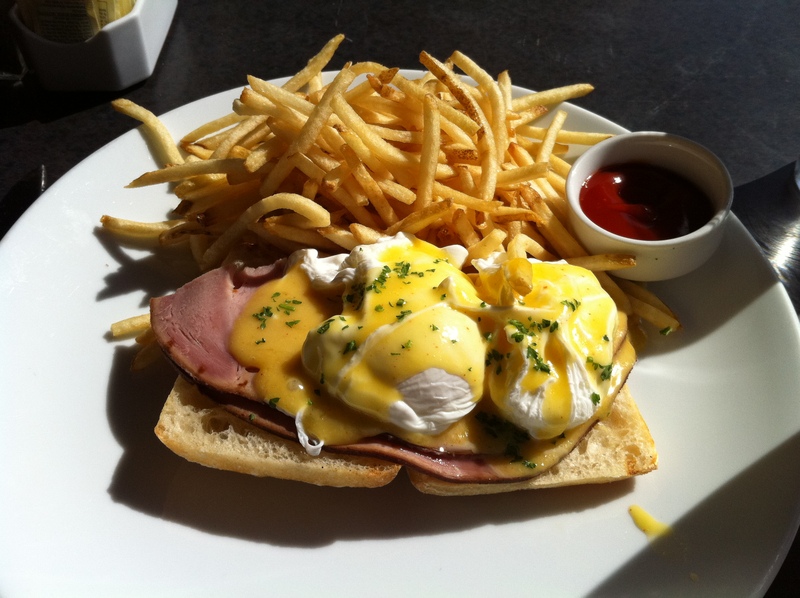 Hollandaise sauce. The eggs are always poached to perfection, with set but still runny yolks that get everywhere and can be mopped up with the (bonus!) pile of fries that comes with them. 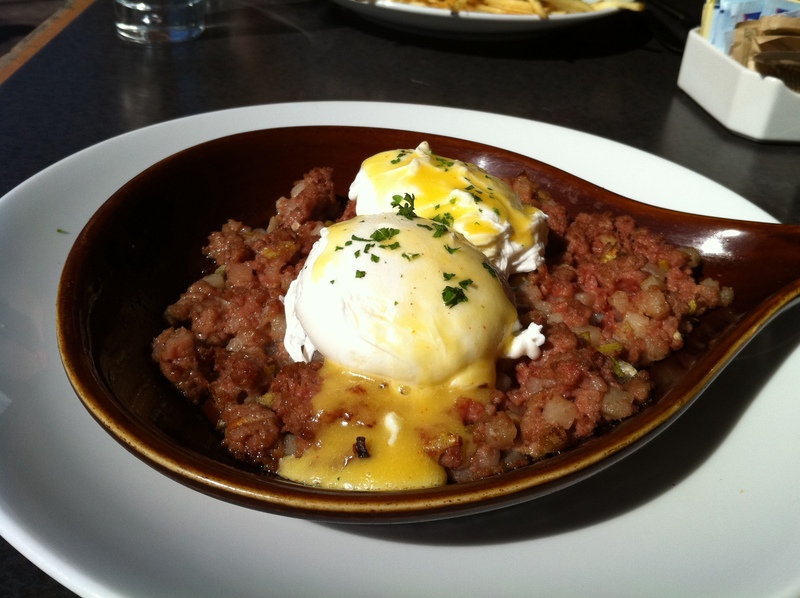 Gina got the corned beef hash, also not something one usually makes at home, which came in a big skillet of beef and onions with more perfect poached eggs on top. It was also very good. If you feel your main brunch course isn’t enough, the Applewood smoked bacon side order is seriously some of the best bacon I have ever had- smokey and just sweet enough, it will be gone from your plate in seconds. There are lots of brunch items I haven’t tried yet, such as the omelets and a very classed-up breakfast sandwich, but this is a brunch in DC that is not to be missed. Have I mentioned that breakfast is my favorite meal? Well, it is. Except for dinner. But it definitely beats lunch by a long shot. I used to detest breakfast, as I’m sure my mother would tell you. This didn’t really have to do with not liking the actual eating of food, rather just the fact that I also tend to value my sleep a lot, and never saw the point in giving up 10 precious minutes in bed to force a piece of toast down my throat before going to school in the morning. 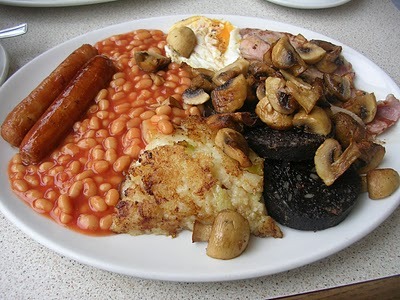 Despite my aversion to waking up early (in middle school I had an infamous shirt with the phrase: “Morning person– not!” on it), I have always loved a good breakfast/brunch, especially a huge full English breakfast, the likes of which would probably give anyone not familiar with it heart attack. In my opinion however, fried bread, sausages, eggs, bacon, and baked beans should be additions to every breakfast table (I usually do without the black pudding though. No thanks). I know you wish you could eat this every morning...right? Anyone? Whatever, it looks delicious to me. Sadly, I do not usually have the time or ingredients to make myself an English breakfast on the weekend mornings when I have enough time to make anything, so I save those for family brunch trips to Soho House in New York. Instead, I tend to rely on tried-and-true favorites such as my famous scrambled eggs (which I may at some point blog about, but only if I decide to give away my secret recipe), soft-boiled eggs with toast soldiers, and poached eggs on toast or with other breakfast fare. I know poached eggs seem intimidating, but they are actually pretty easy to make once you’ve practiced a couple of times (or just buy something like this). Some people use white vinegar to help the whites coagulate, but I don’t particularly feel like buying white vinegar for this one purpose, so make do without. Oops, lost some egg whites in the tornado. When I’m making poached eggs I just bring a big pot of water to boil, turn down the heat very slightly so the bubbles aren’t going crazy, and create a tornado-like swirl with a wooden spoon. Then very quickly either crack an egg or slide an egg you have already cracked into a bowl into the middle of the water, and kind of coax the water back into a swirl with your spoon again for a couple of turns. At this point the water will probably be very foamy with egg white that has floated to the top, but the key is to have faith that your egg will cook and come together. Cook for 2-3 minutes and you should have a perfectly soft poached egg. It definitely takes a couple of practice tries to get the technique down, but as long as you come to terms with losing a couple of eggs in the process you should be fine. 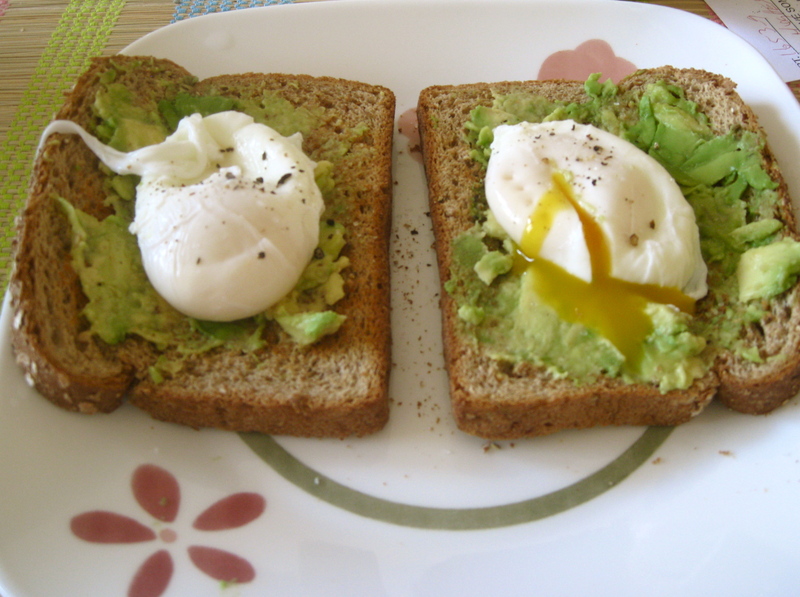 The recipe below is poached eggs with avocado toast, which is a delicious and cheap combination, and as a bonus, only requires you to have three ingredients in your kitchen! 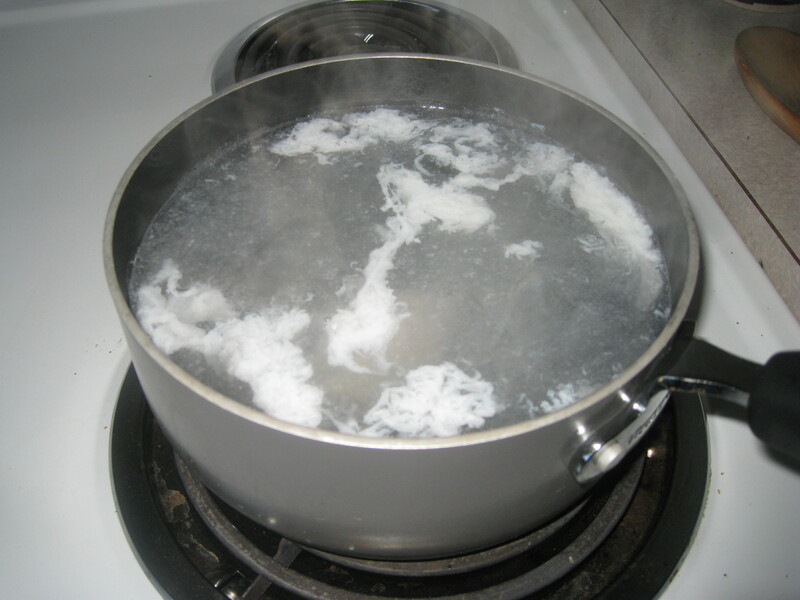 Begin by boiling a large pot of water to poach the eggs in. When the water is boiling, put your bread in the toaster and then get ready to poach some eggs! Have your eggs out of the container and right next to the pot, and using a wooden spoon, begin to stir the water so it is moving very fast in a circular motion. When the water is spinning around crack the first egg into the center of the pot, pick up your spoon and continue to move the water in a circular motion. The white should congeal around the yolk in a few seconds; don’t worry if you lose some of the whites to the surface! Cook for 2 1/2 minutes until white is set and yolk is runny inside. While egg is cooking, take the bread out of the toaster and halve your avocado. Divide one half of the avocado and spread over both pieces of toast (save other half for another use), then squeeze a little lemon juice over each piece. When the egg is ready, remove with a spoon (preferably slotted, but just try not to get too much water in it if you don’t have one) and place onto the avocado-toast. Repeat the process with the second egg. Salt and pepper your eggs before serving, and enjoy! I feel like a hippie writing this, but I started to make my own granola this summer and it has become something of a hobby of mine. I’ve only ever used variations on Mark Bittman’s recipe, which I understand to be somewhat controversial because it doesn’t use any oil or other fat. While this does mean that there are no clumps in the granola, I think I prefer it this way. Granola really is the easiest thing in the world to make—just go to a good grocery or health food store and pick out whatever seeds and nuts you like, and toss it all together. I’ve been going to Whole Foods for this, but have been pretty disappointed by their selection—it seems they sell more pre-made granola in their bulk containers than they do seeds or nuts. I’ve put below the proportions I’ve settled on that matches my personal preference, but I urge you to go look at Bittman’s recipe for more ideas to figure out what you might like. Preheat oven to 350 degrees. In a big bowl, combine all ingredients except dried fruit. Spread on cookie sheet and bake for 30 minutes or longer, stirring at least every 10 minutes to ensure it bakes evenly. Take it out whenever you feel it is done– the browner it gets, the crunchier it will be. Remove pan from oven and stir in dried fruit. 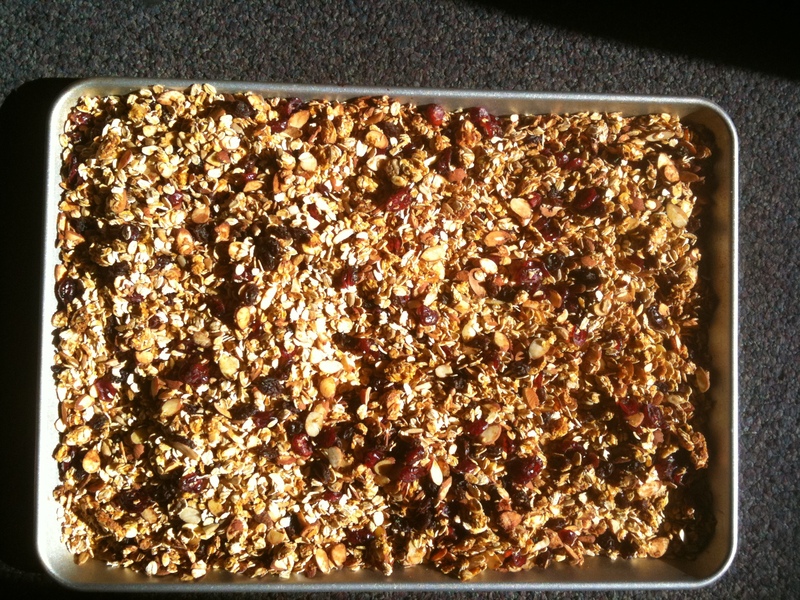 Cool on tray, stirring occasionally, and transfer to sealed container once granola reaches room temperature. Enjoy with milk, yogurt, or as a snack on its own.